Home > Articulate Global, Inc.
Found 4 file extension associations related to Articulate Quizmaker and 4 file formats developed specifically for use with Articulate Quizmaker. Quiz creation has never been so quick—or so creative. 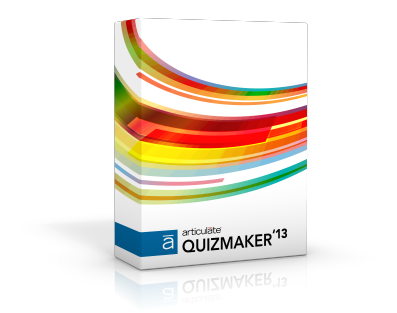 Articulate Quizmaker gives you unprecedented power and freedom in a new streamlined interface. Whether you're a new or seasoned quiz creator, you'll easily create professional, custom Flash quizzes and surveys. Form-based editing with form view: Build a professional quiz in minutes—it's as easy as filling out a form. Just tab from field to field. Free-form editing with slide view: Create your own vision with the freedom of developing in Flash but with none of the hassles. Switch between modes at any point—you're always just one click away. Thanks to Quizmaker's clean, friendly interface, you'll easily apply advanced features. And if you want some tips with all this power, we offer the best support in the industry—but you're not likely to need it. Quizmaker offers question types that go beyond the basics. Of course, you'll have professionally designed multiple-choice, true/false, and Likert questions. But you'll also surprise and engage your quiz takers with drag-and-drop questions, hot spots, and more (20 different types in all!). If you need more information please contact the developers of Articulate Quizmaker (Articulate Global, Inc.), or check out their product website.